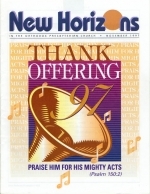 The theme of our 1997 Thank Offering is "Praise Him for His mighty acts" (Ps. 150:2 NKJV). 1. Blessed is the man who does not walk in the counsel of the wicked or stand in the way of sinners or sit in the seat of mockers.